Keeping your refrigerator organized may get on your nerves, especially if you are a working woman and short of time. A well-ordered fridge is the key to keep your food fresh for a long time. So, think about the right place for your groceries to save money as well as time in cleaning the clutter. Read the article to find out 28 simple ways to keep your fridge clean and organized. It is very easy to organize the things in baskets. Moreover, baskets are very easy to slide out. Put a label on the baskets, if you are forgetful. Label the door of the fridge with the help of a dry-erase marker, in order to remind yourself which items are available in the refrigerator and which items need to be used on priority. Line the shelves of your fridge with plastic easy-to-clean mats so that they can be wiped off easily in case of any spills. Milk goes sour in the door of fridge faster as temperature frequently fluctuates there, so avoid keeping milk and other dairy products in the refrigerator’s door. If you store salads in mason jars, they will stay fresh for more than a week. Keep seafood on the bottom shelf to prevent unwanted drips. Wrap meat products properly and also keep them on the lowermost shelf to avoid accidental dripping and leakage. Make use of plastic bags or boxes to store juicy meats like bacon as they are very difficult to re-wrap once used. Ask your children to find out the expired items from the fridge. Teach them how to organize condiments, dairy and produce. Also, instruct them not to keep the door of the fridge open for a long time. Prepare a spreadsheet of the items, you purchased, along with the purchase date, their shelf life, and quantity. It will help you keep track of the items that are going to perish earlier. Make use of V-shaped clips to prevent wine bottles from rolling and keep them firmly stand in their place. Make use of binder clips to hold the bottles of beer in their position. Store the contents of your freezer in plastic labeled containers, in order to save the space. Make use of magazine holders as instant freezer shelves. Potatoes, tomatoes, peaches, coffee, honey, onions, and garlic need not be chilled, so you can save precious space in the refrigerator by storing these food items elsewhere. Make use of color code like red box to store the things that may stale in next 2 days, transparent or green box to store salads and cut fruits, etc. Before stepping out for grocery shopping take a picture of your refrigerator or keep a checklist of the items you already have so as to avoid wastage of money in buying them and refrain from the nuisance of storing them. Make use of containers that can hold six bottles simultaneously and can be placed in the door of the fridge. Keep a container of activated carbon to absorb the odor from the fridge, and then it will smell good and fresh. Activated carbon works much better than baking soda. Keep a roll of masking tape handy near the fridge so that you can label containers with their open date. It will help you use the products before their expiry date. Bring an egg holder to organize the eggs in the fridge. It will protect the eggs from cracking and you may even stack things on top. Pull your fridge 1-2 inch away from the wall; this will reduce energy usage up to 40%. 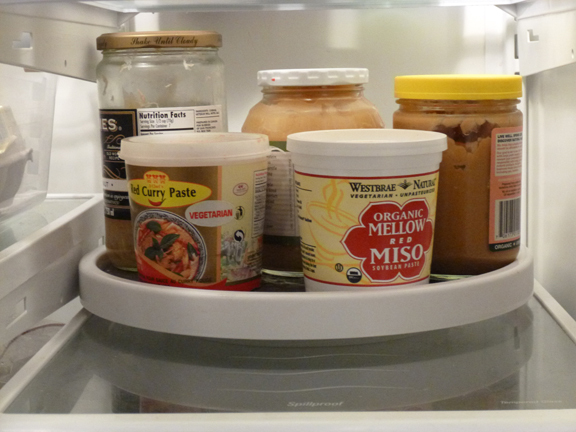 This trick will help you utilize the available space in the refrigerator optimally. Also, you can easily access the things. Use an empty egg carton in the fridge door and use it to store mustard bottle. This will aid in keeping the refrigerator’s shelves clean. Label your fridge containers that contain ready-to-use items as “Eat Me First”. This will enable you to use the food items efficiently and avoid rotting. Use crystal light containers or zip lock bags to keep cut vegetables. Crisper drawers are easy to slide out. Use them to store vegetables and fruits. You can easily store the leftovers, veggies, cheese and condiments in Lazy Susan. It also makes the things easily accessible.